The U.S. Environmental Protection Agency and the Army Corps of Engineers have beefed up their guidelines for wetlands mitigation in Alaska, elaborating on ways a developer can compensate for disturbing bogs, ponds and streams. The idea of mitigation is that developers are permitted to fill a wetland if they restore or protect a similar property nearby. But mitigation is challenging in Alaska, where much of the state is considered a wetland and opportunities to restore private land in the area may be scarce. 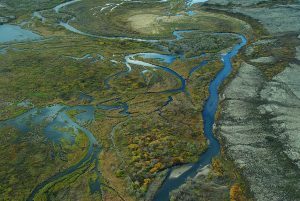 Energy & Environment News reviewed wetlands permits in Alaska going back to 2015 and found the Corps had only required mitigation 26 percent of the time. The new agreement between the federal agencies says the mitigation can be farther afield from the construction project and may be on public land. It also allows “out of kind” mitigation, meaning that the project may involve filling a wetland, but the mitigation for it could be the restoration of a stream. It’s unclear whether the guidelines will result in more mitigation projects in Alaska, but E&E News says it seems to take aim at several of the justifications the Corps used to conclude mitigation was not required for particular permits.